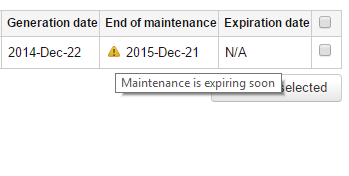 In the attached screenshots, the warning notice and license expiration details can be seen. My question is that are we allowed to upgrade to a newer version of TeamCity at the moment before renewing the license? Due to some technical requirements, we need to upgrade the server asap, so renewing the license can be sought out later. So are we allowed up till this point to upgrade the server before license renewal? TeamCity 9.1 has been released on 26 June 2015 and your license covers this date. So you can upgrade to any 9.1.x version and your licenses will work.